A decade ago, the prosumer camcorder ruled mid-level production. First with MiniDV and then with HDV, it enabled an entire segment of the market to produce corporate, educational, documentary, special event, and other content without needing broadcast gear. Then came large-sensor video cameras and video-ready DSLRs, beginning with the Canon 5D Mark II, a full-frame 35mm camera. It delivered the shallow depth of field (DoF) that was considered the “film look,” despite the fact that motion picture cameras have a smaller image area, nearly identical to APS-C or crop-sensor digital cameras. Eventually, the big camera makers responded with big sensor, APS-C, and even larger cameras and camcorders. There were also a few smaller sensors such as Micro 4/3 and 1" that grew into this market as well. But the DSLRs and the more production-ready, interchangeable-lens, large-sensor camcorders that evolved left a hole in the middle of the market. In between tiny-sensor prosumer camcorders and higher-end large-sensor camcorders that required extensive investment in lenses, a need remained for a large-sensor model with the convenience of a prosumer camcorder and an integrated lens. 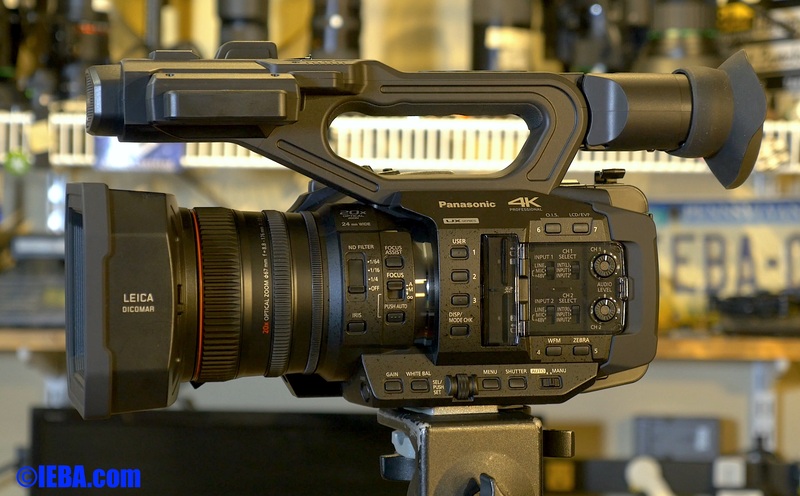 About a year ago, Panasonic introduced the AG-DVX200 camcorder, built around technology devised for its very successful GH4 4K DSLR. While it wasn’t an APS-C-based camcorder with an integrated zoom lens, the DVX200 was about as close as you could get at the time. It had only a few operational limitations that might hold back professionals. One was the short zoom, a trade-off necessary to keep the camera’s weight and price point down. As a sensor gets larger, the glass required to deliver a bright, long, and high-quality zoom gets bigger, heavier, and more expensive. If you could compromise with the sensor size, you could get a longer zoom while still avoiding the tell-tale 1/3" sensor or “cell phone” look where everything in the shot is in focus. That’s where Panasonic’s AG-UX180 (Figure 1, below) strikes a balance well-suited to the prosumer market. Not only does it have a 20x optical zoom (plus some digital zoom on top of that); it does so with a 1" sensor that enables the user to capture some shallower DoF imagery than one would expect in a camcorder this size. All of Sony’s 1" prosumer camcorders, such as the PXW-Z150, are limited to 12x optical zoom, which places the UX180 well ahead of the competition in this respect. I’ve reviewed several Panasonic camcorders over the years and this one really feels comfortable to me. Controls for certain features are where I expect them to be, by and large. The “business side” of the camcorder puts Gain, White Balance, Shutter, and Iris controls along the bottom edge, similar to the Sony design. In addition, one can slide between several of these settings just by rotating the dial in the middle of these control buttons. It’s also how you navigate the menu, if you’re not using the touchscreen. Dual SD card slots handle recording duties. Regardless of which record mode you’re in—dual, cascade/relay, or recording 4K on one card and HD on the other—this camera has you covered. There are eight user-assignable buttons for about 44 different camera functions. Some of the most used—OIS, LCD/EVF, WFM, Zebra, and Rec Check—are pre-assigned, but you can change them if you want. For instance, the viewfinder has an eye sensor, so do you really need a button to tell it to send the image to the eyepiece? I was hoping that the camcorder could display an image to me on the eyepiece and to the person in front of the camcorder using the LCD screen flipped around so they could see, but no such luck. This button could easily be used for other purposes. 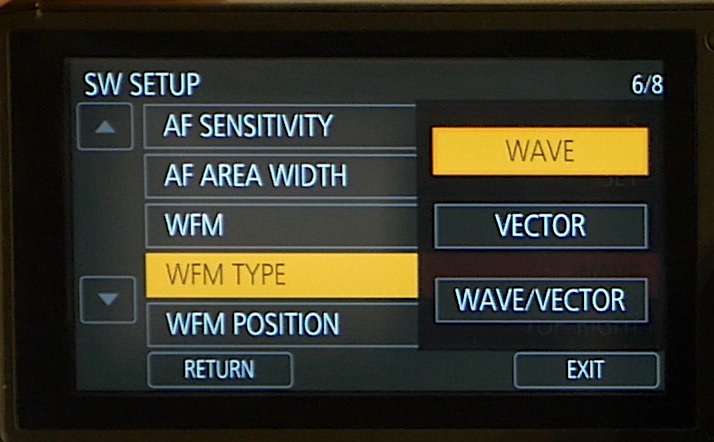 The UX180 features a built-in waveform monitor and vectorscope, which you can use separately or have both meters on-screen (Figure 2, below). This is a huge feature for properly assessing an image. Waveform and vectorscopes provide a clinical way of assessing the image without requiring you to calibrate the monitor. The information they convey doesn’t change if you have glare on the screen, or tired eyes after 8 hours of production. The audio controls include the ability to select between either of the internal, forward-facing microphones, or either of the XLR inputs on the body of the camcorder. One is placed up front for easy connection to a higher-quality shotgun mic if you desire. The other is placed at the rear of the camcorder for easy connection to house sound at line level if you want. Either input can be internal mic, external XLR, or external XLR with phantom power, set to mic or line level. Interestingly, you can even set both left and right channels to either one of the external inputs. So if you have one line-level input, you can feed it to both channels in the camcorder. This means you don’t have to worry about summing it to mono later in post. Alternatively, you can “protect” the audio by setting one channel 12–20dB lower than the other, so that if there’s a loud sound that clips the main channel, the second channel will record it without distortion. The new Panasonic Lumix GH5, introduced at CES, looks like an improved GH4, but each of improvements addresses user requests, complaints, and issues with the GH4—as well as what Panasonic sees going on with the competition. Put them all together, and the GH5 appears to be a very solid piece of kit that can't be found in any competitor's portfolio.